Glendora, Calif. -- Top Fuel title contender Brittany Force piloted her Monster Energy dragster to the quickest pass in Auto Club Raceway at Pomona history during qualifying at the 53rd annual Auto Club NHRA Finals. Jack Beckman (Funny Car), Greg Anderson (Pro Stock) and Chip Ellis (Pro Stock Motorcycle) were also preliminary qualifiers in their respective categories at the final event of the 2017 NHRA Mello Yello Drag Racing Series season. Force, who entered the race only 20 points behind first, put down a 3.667-second pass at 330.31 mph in the second qualifying session to take over the Top Fuel lead. Clay Millican is in the second spot with is 3.671 pass at 328.22 while reigning Top Fuel world champion Antron Brown sits in the third position. Current points leader Steve Torrence is in the fifth position. Southern California native Beckman raced to the top of the Funny Car field with his 3.835 pass at 334.98 in his Infinite Hero Foundation Dodge Charger R/T during the second session. Courtney Force debuted her Advance Auto Parts/Big Machine Records Chevrolet Camaro SS with a 3.871 pass at 334.57 to put her in the second qualifying spot. Tommy Johnson Jr. sits in third. Championship front runner and Force’s teammate, Robert Hight is currently unqualified while reigning world champion and second in points Ron Capps is seventh. Anderson, who is leading the championship chase in Pro Stock, raced his Chevrolet Camaro to a 6.561 pass at 210.67 in the first qualifying session. 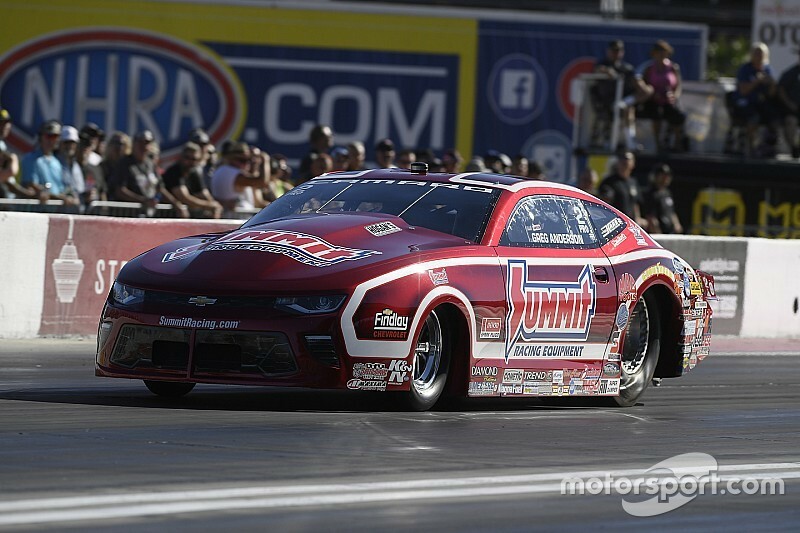 Drew Skillman is currently in the second spot after racing a 6.555 at 211.69 and veteran Jeg Coughlin Jr. is in third. Championship contenders Jason Line and Bo Butner are currently qualified sixth and seventh, respectively. In Pro Stock Motorcycle, Chip Ellis rode to a 6.805 pass at 196.53 to lead the field. 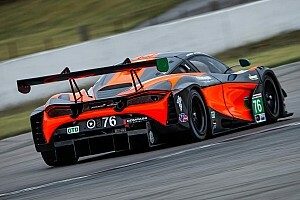 Ellis was quickest in both of the qualifying sessions. Ellis is racing to secure his first No. 1 of the season and first since 2015. Ellis’s Screamin’ Eagle/Vance & Hines Harley-Davidson teammates Andrew Hines and Eddie Krawiec are qualified second and third, subsequently. Krawiec needs only to qualify for the event to clinch his fourth NHRA Mello Yello Drag Racing Series Pro Stock Motorcycle world championship. Qualifying at the 53rd annual Auto Club NHRA Finals continues Saturday at 11:50 a.m. Catch the action live on FOX Sports 1 (FS1) at 6 p.m.
Top Fuel — 1. Brittany Force, 3.667 seconds, 330.31 mph; 2. 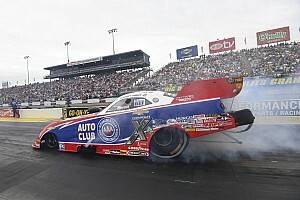 Clay Millican, 3.671, 328.22; 3. Antron Brown, 3.696, 326.00; 4. Leah Pritchett, 3.712, 326.32; 5. Steve Torrence, 3.719, 289.26; 6. Richie Crampton, 3.748, 316.23; 7. Doug Kalitta, 3.755, 326.71; 8. Wayne Newby, 3.785, 324.59; 9. Troy Buff, 3.785, 320.43; 10. Terry Haddock, 3.874, 307.51; 11. Blake Alexander, 3.941, 297.61; 12. Steve Faria, 4.096, 232.71; 13. Shawn Reed, 4.337, 193.38; 14. Scott Palmer, 4.357, 183.00; 15. Mike Salinas, 4.508, 260.91; 16. Tony Schumacher, 5.987, 117.35. Not Qualified: 17. 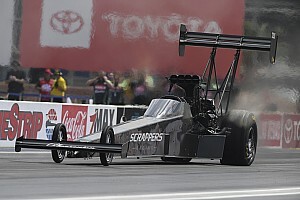 Terry McMillen, 6.862, 100.55; 18. Shawn Langdon, 7.333, 89.35. Funny Car — 1. Jack Beckman, Dodge Charger, 3.835, 334.98; 2. Courtney Force, Chevy Camaro, 3.871, 334.57; 3. Tommy Johnson Jr., Charger, 3.887, 314.31; 4. Alexis DeJoria, Toyota Camry, 3.894, 331.94; 5. Tim Wilkerson, Ford Mustang, 3.913, 327.74; 6. John Force, Camaro, 3.955, 316.60; 7. Ron Capps, Charger, 3.956, 322.19; 8. Gary Densham, Mustang, 3.968, 319.07; 9. Jeff Diehl, Toyota Solara, 4.107, 296.31; 10. Jeff Arend, Chevy Monte Carlo, 4.140, 252.90; 11. Del Worsham, Camry, 4.358, 204.17; 12. Bob Bode, Charger, 5.692, 125.80; 13. Jonnie Lindberg, Camry, 7.119, 87.17; 14. Matt Hagan, Charger, 7.606, 91.30; 15. Cruz Pedregon, Camry, 7.748, 87.01; 16. Jim Campbell, Charger, 7.779, 84.77. Not Qualified: 17. Robert Hight, 7.801, 85.35; 18. J.R. Todd, 8.319, 82.60. Pro Stock — 1. Greg Anderson, Chevy Camaro, 6.541, 210.67; 2. Drew Skillman, Camaro, 6.555, 211.69; 3. Jeg Coughlin, Camaro, 6.558, 210.47; 4. Tanner Gray, Camaro, 6.564, 210.64; 5. Erica Enders, Camaro, 6.565, 209.85; 6. Jason Line, Camaro, 6.565, 209.65; 7. Bo Butner, Camaro, 6.566, 210.28; 8. Chris McGaha, Camaro, 6.571, 211.36; 9. Brian Self, Camaro, 6.574, 210.57; 10. Alex Laughlin, Camaro, 6.586, 210.24; 11. Shane Gray, Camaro, 6.595, 210.64; 12. Allen Johnson, Dodge Dart, 6.595, 209.95; 13. Matt Hartford, Camaro, 6.599, 210.67; 14. Kenny Delco, Camaro, 6.615, 209.88; 15. Deric Kramer, Dart, 6.642, 208.26; 16. Alan Prusiensky, Dart, 6.665, 207.34. Not Qualified: 17. Shane Tucker, 6.714, 205.91; 18. Val Smeland, 6.766, 202.94; 19. Joey Grose, 6.944, 195.53; 20. Steve Graham, 19.954, 42.94. Pro Stock Motorcycle — 1. Chip Ellis, Harley-Davidson, 6.805, 196.53; 2. Andrew Hines, Harley-Davidson, 6.817, 197.45; 3. Eddie Krawiec, Harley-Davidson, 6.836, 197.77; 4. LE Tonglet, Suzuki, 6.861, 195.96; 5. Scotty Pollacheck, Suzuki, 6.862, 193.38; 6. Steve Johnson, Suzuki, 6.878, 193.96; 7. Joey Gladstone, Suzuki, 6.905, 193.68; 8. Jerry Savoie, Suzuki, 6.925, 192.63; 9. Angie Smith, Buell, 6.927, 193.60; 10. Karen Stoffer, Suzuki, 6.932, 191.89; 11. Hector Arana Jr, Buell, 6.953, 194.94; 12. Katie Sullivan, Suzuki, 6.967, 191.02; 13. Matt Smith, Victory, 6.970, 195.73; 14. Freddie Camarena, Suzuki, 6.985, 194.30; 15. Lance Bonham, Buell, 7.152, 187.94; 16. Luke Crowley, Suzuki, 7.294, 188.94. Not Qualified: 17. Ryan Oehler, 8.168, 113.09.